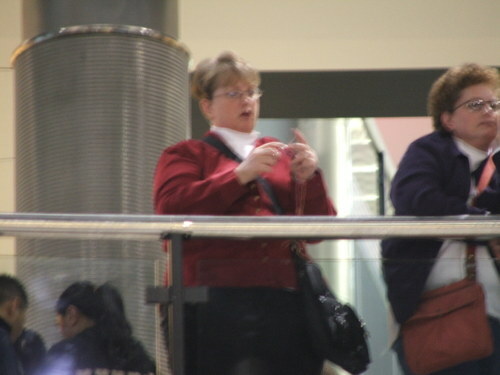 Knit-Out @ Mall of America: an eyewitness report. Film at 11. No, wait, there's video below. Keep reading. When one goes to the MoA on a Saturday afternoon, one ends up parking on the topmost level of the parking ramp, which gives one the unexpected benefit of some nice camera angles when one reaches the rotunda, where the Knit-Out was happening. 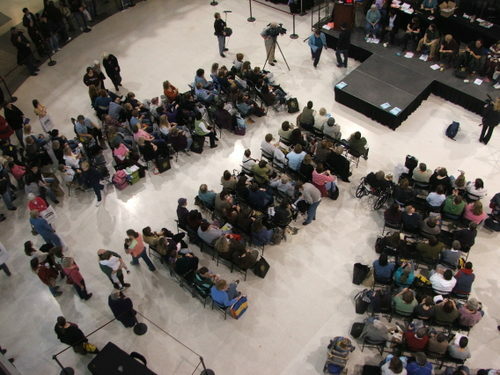 The publicity for this event all talks about how there were 50,000 people attending the Knit- & Crochet-Out. Do not believe it. The rotunda was more crowded later than it was in the above photo, but 50,000? In your dreams nightmares. There may have been 50,000 people in and out of the Mall on Saturday, but I think the knitters and crocheters numbered somewhere between 500 and 5,000. 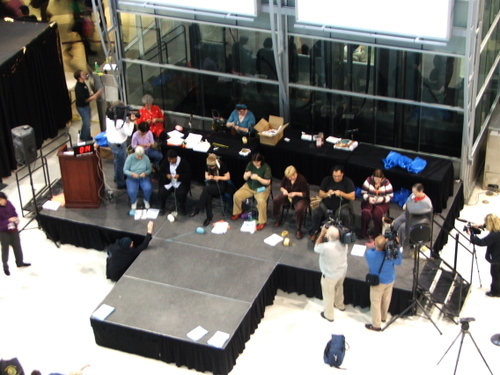 On stage at the moment of the above photo, about 3 p.m., was an assortment of local knitters competing in a speed-knitting contest. Someone had alerted the media. 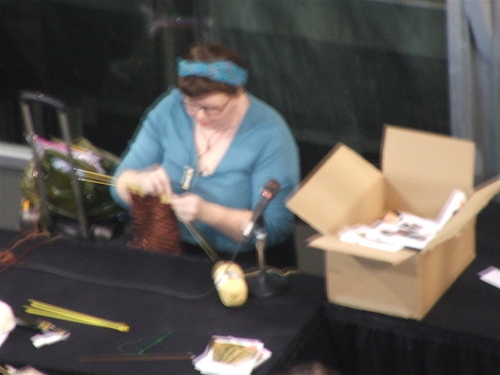 The winner of this heat was our own local-since-last-year Annie Modesitt, shown here whippin' out the knittin' at 172 stitches in three minutes. She was blazin'! Earlier there had been demonstrations and giveaways in various locations around the mall, but I had to work earlier in the day so I missed all that. But I was there for (ta da!) 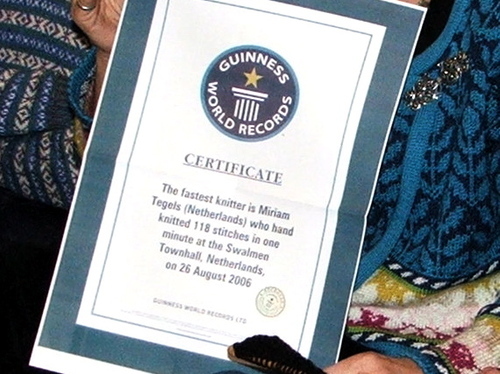 the World's Fastest Knitter competition. The lovely woman at her left in the stunning hand-knit shawl is The Domiknitrix. I was lucky enough to be sitting next to a woman who knew a lot about this stuff. 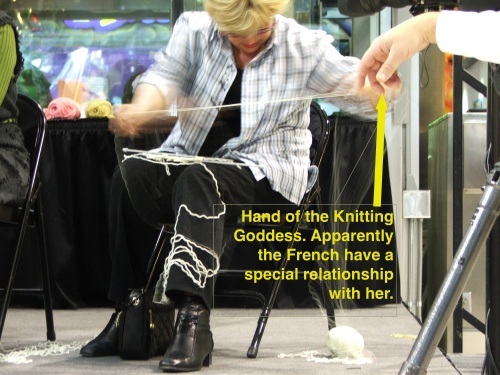 She is an author from Ithaca, NY, and is writing a book called Wound Up about various over-the-top things that knitters do. 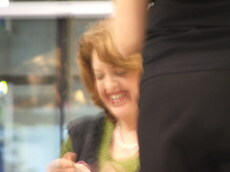 The book will be published next year; she told me who the publisher is, but the rotunda was noisy and I didn't catch it. Tragically I didn't get her name, either. Whoever you were, ma'm, I am indebted to you for your knowledge and enthusiasm and willingness to share. She told me that the title of fastest knitter on the planet varies, depending on whether the contest is based on knitting garter stitch or stockinette or something else. The certificate above doesn't specify, but I think she said it was for stockinette. The contest I am about to describe featured garter stitch, done with "...size 4 yarn..." Neither I nor any of the knitters around me knew what that was. Since then the internets have informed me that size 4 yarn = worsted weight. Okay, whatevs. (clockwise from upper left) Adrienne (or something like that) from France; Lisa, representing the US but originally from Germany; Hazel, from the Shetland Islands and representing the UK; the aforementioned Miriam from the Netherlands; and Juanita Wannietta (Wan-ee-ta) Prescod from Canada. 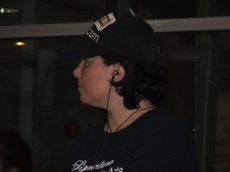 Notice Juanita's Wannietta's earbuds; they will be important later. I learned there are certain procedures that are de rigeur for a speed-knitter. Those sweet ankle warmers and prim feet at right belong to Lisa, from the US/Germany. Don't want no snaggin' on the yarn. Okay. It's time. Three heats, each one three minutes long. Truly, the needles were a'flyin'! You are not going to believe these videos. ARGGHHHH! My computer is giving me fits. Even though I can see the videos in iPhoto and watch them in QuickTime, I cannot find the files on my hard drive. I'll put up this post and continue to futz around. Wish me luck. ETA: I give up. But here is a video I found on YouTube of Hazel. Watch and be amazed. Oh, remember Juanita Wannietta's ear buds? 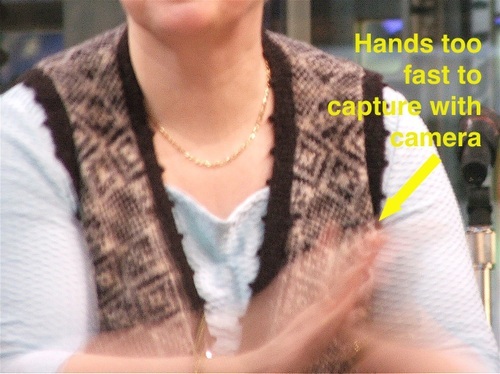 Apparently she cranks up the music when she speed-knits because she was rockin' out in her chair while she competed. She was fun to watch. In the meantime, here are a few other shots from yesterday. 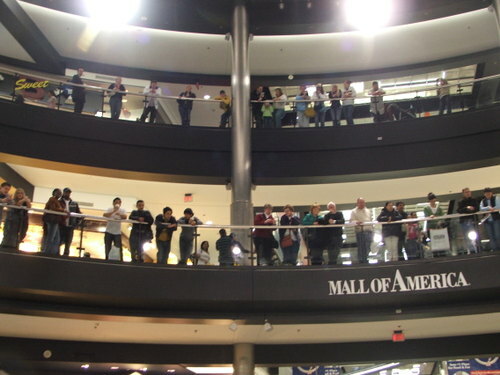 The folks overlooking the action in the rotunda. Wait! 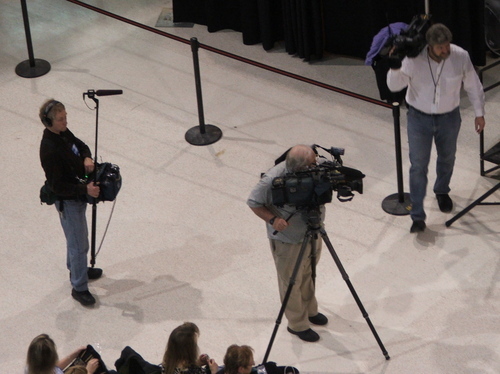 What is that woman in the red jacket in the center doing? 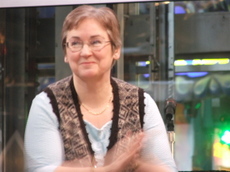 Hazel from the Shetland Isles, who won the competition handily. Hah! Get it? Handily? 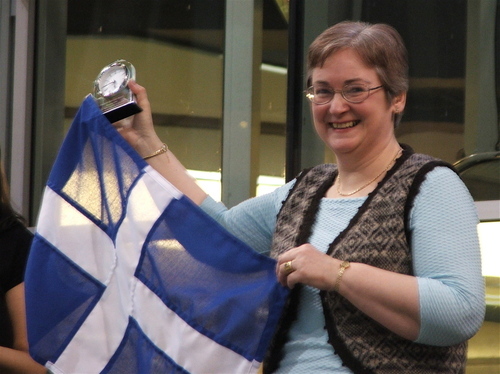 Her husband handed her the Scottish flag. 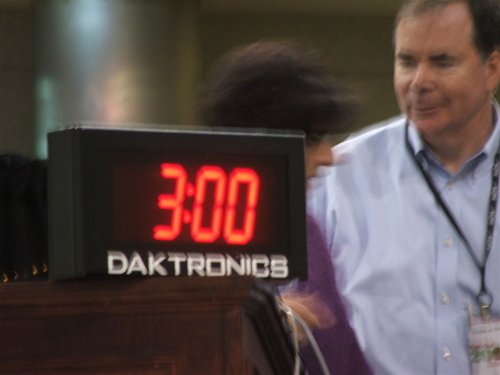 The clock -- plus, of course, world-wide bragging rights -- was her prize for winning the competition. Her knitting speed? 240+ stitches in each of the first two heats, faster than anyone else in those heats, and 260+ stitches in the third. 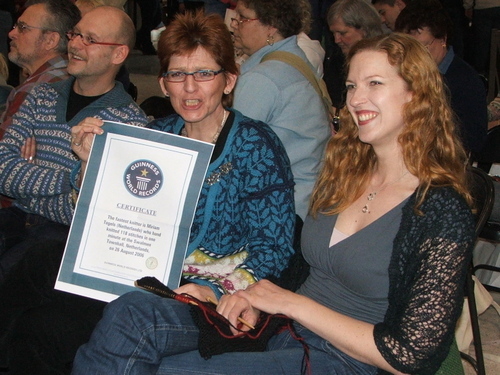 The other knitters' speeds in the three heats ranged from 170+ (Adrienne) to 240+ (Miriam, maybe others). Hazel blew them out of the water. 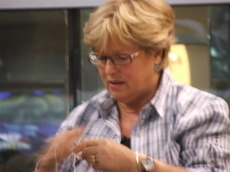 Four of the five competitors used straight needles; one, Lisa of the US/Germany, used a circular. Interestingly but probably not surprisingly, the four straight-needle knitters each wedged her right needle somewhere -- under an arm, in the crotch, in the crease between her leg and groin. I seem to remember the Yarn Harlot mentioning that she uses that first position, having been taught by her grandmother, who was a production knitter. I could not tell easily whether each knitter was a picker or a thrower because their hands and fingers made such tiny movements. (After studying my photos I see that Adrienne from France was a thrower and that Lisa from the US/Germany was definitely a picker.) 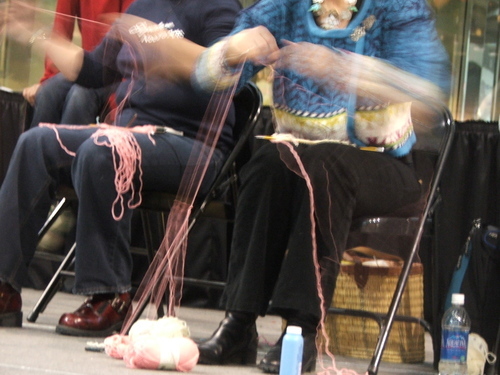 Each knitter confined her movements to about two cubic inches of space. No extraneous motions. Astonishing. 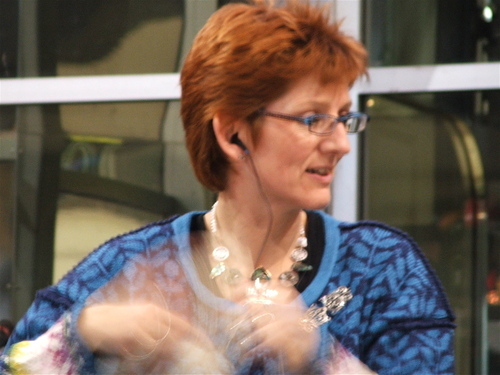 The author had chatted with Hazel and shared some of what she had learned. Hazel started knitting at age 7 or 8 and began knitting for money at age 15. 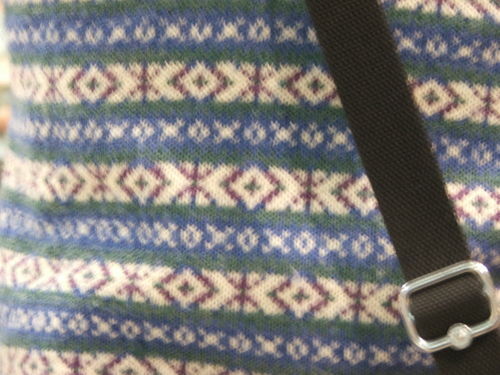 She told my author that none of the young people in the Shetlands are interested in Shetland-style knitting; the only people who still know how to do it are over 50 (like her) or over 70 (more commonly). These women are national treasures who won't be around much longer. The husband of Hazel the Winner Miriam Tegels, the speedknitter from the Netherlands, was wearing a lovely Fair Isle sweater that she had knitted for him. Probably took her about 30 seconds.